These days one doesn’t think twice when looking at a magazine spread of a fashionable femme fatale striking a pose in an exotic locale, or a candid shot of a model in the streets, but the genre of fashion photography owes a great deal to one of its original pioneers in the form of British photographer Norman Parkinson. One of the earliest to shoot “on location” in 1936, Parkinson rejected the staid, early 20th century prescriptions of demure women and noble housewives, and replaced them with images that were instinctive and fun, unstructured and yet meticulously composed of charm and glamour. 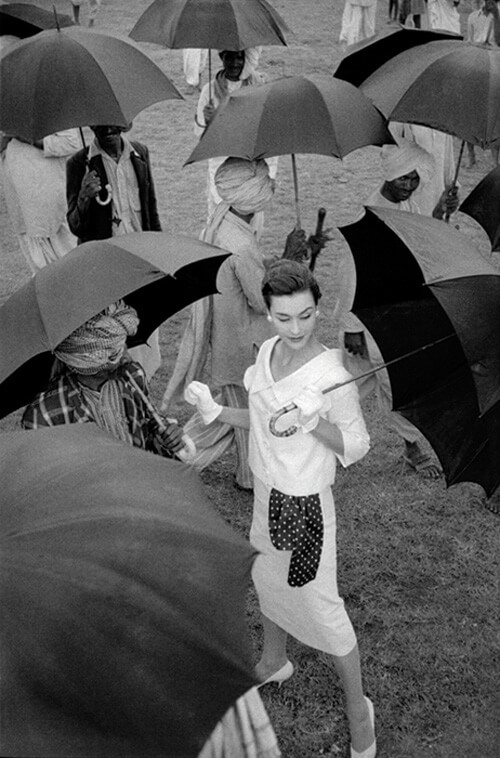 In them, the daring readers of Vogue and Harper’s Bazaar travelled the world, walked tall with giraffes, romped over Soviet monuments and yes, even visited India to sashay with the elephants. In a career spanning seven decades, ‘Parks’ brought a unique inventiveness to the practice of photography. An accomplished portaitist and a master of colour, one of his most famous shoots was a 1956 essay for British Vogue. 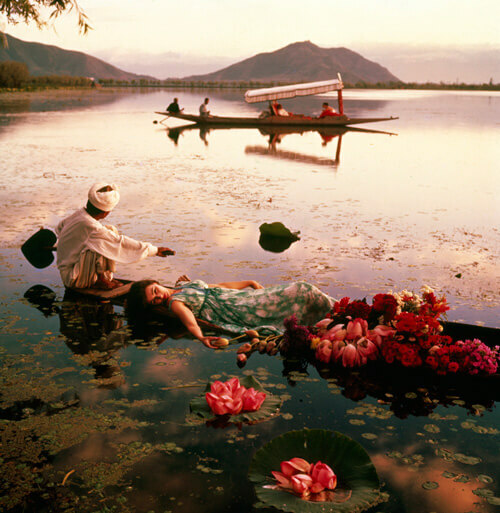 In a ground-breaking project that would be prohibitively expensive even today, Parkinson travelled the length of India from Kanyakumari to Kashmir and in the process created a remarkable set of colourful images. 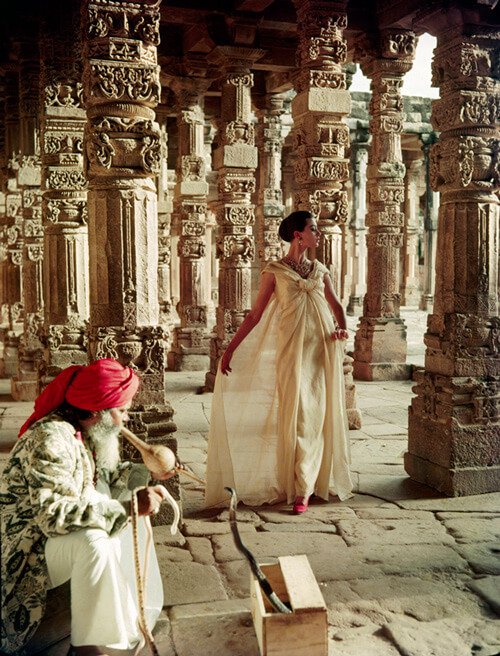 When the legendary fashion editor Diana Vreeland saw these pictures, she exclaimed, “How clever of you, Mr. Parkinson also to know that pink is the navy blue of India.” These pictures are now at the core of a travelling exhibition titled, Pink is the Navy Blue of India organised by Tasveer, India’s leading photography gallery. Digging deep into the Norman Parkinson Archive, the exhibition is a delightful study of colour and composition. That Parkinson was a master of both is evident both in an image of Barbara Mullen floating languidly in a Kashmiri shikara and of Anne Gunning caught in the flurry of an Aurangabag market, but it is his attention to every detail of the setting that sets him apart: the environment becomes a character in each story, the local people it’s interpreters and while the snake charmer might be an overused trope today, the image of Mullen wafting through the Quwwat-Ul-Islam Mosque (below) would’ve certainly been the poorer without it. Every one of these photographs is a moment in time, a still frame in a moving picture on a journey through unknown lands. For an India that is more aware of itself perhaps now more than in the 1950s, Parkinson’s photographs are interesting in that they present one way in which the country has come to live in Western imagination. The elephants, busy markets, lush vegetation and royal regalia that abound in these images, continue to be markers of an exotic India and one wonders what Parkinson’s image-making reaction would have been to the cell-phone toting, IT speaking, glass and steel cities that dominate the landscape today. Nevertheless, Parkinson’s photographs are as fresh now as they would have been in November 1956 when they were first published and his hallmark inventiveness ensures that there is nothing jaded about them. The enduring charm of Parkinson’s work has made Pink is the Navy Blue of India one of Tasveer’s most popular shows ever. We caught it at the ICIA in Mumbai a couple of weeks ago, but we’ve been told that it’s likely to travel to more Indian cities than were originally planned. We’d encourage you to check out Tasveer’s page to find out more about it in coming months.